Yankees GM Brian Cashman made a wise decision when he announced there would be no changes to the coaching staff during the 2017 transition season. This meant that Larry Rothschild was brought back for the seventh year as the Yankees, pitching coach. While the Yankees and their fans have little to quibble about lately with Cashman, he may or may not have done so reluctantly just to keep the line of talented pitchers moving through the minor league system, with no interruptions on the 25-man roster. But hopefully, Cashman has already begun the search for the replacement of Rothschild in 2018. The Yankees may have made a telling decision when they signed pitching coach, Larry Rothschild, to a one-year contract for 2017. Because if you read between the lines, manager Joe Girardi has a contract that is expiring at the end of this season as well. Coincidence? – Not likely. Because if I were Rothschild, I would not be thinking of buying a home in the New York area anytime soon. Larry Rothschild has managed to be, whether intentionally or not, one of those guys in the organization who flies under the radar. 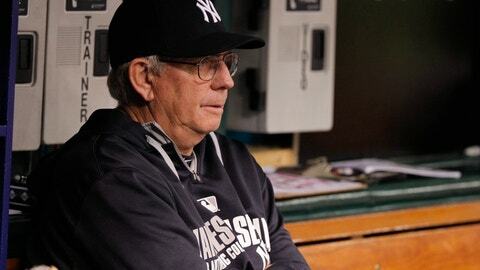 We see him in the dugout standing next to Joe Girardi wearing his warm-up jacket, with an expression etched on his face, even more, stoic than his boss. And for Betances, it must have been a relief to find out that he’s human. But what else did he learn from the man who was supposed to be teaching him? What about my pitch selection, coach? Did I rely too much on my X pitch today? “I look at Severino, and he’s one-dimensional. He’s a maximum effort guy. It doesn’t look like he’s thinking a lot about pitch sequence,” former Yankee and current YES Network analyst John Flaherty said last week. “When you start, you can’t throw it 95-100 every pitch,” former Yankee and current YES Network analyst Al Leiter said. “And if you only have a slider and your slider is not (thrown) for a strike, now what are you going to do? Now basically you become a fastball pitcher, and then automatically your fastball goes down (in velocity) because hopefully as a starter you’re going to throw 100-110 pitches per outing, and it’s different. Now, the question must be introduced. If these two former players can observe all of that from 120 feet away from a broadcast booth, why hasn’t Rothschild been able to notice the same things, present them to Severino, and convince him to change his ways, when he sits face to face with the man every day for six months? Even worse, perhaps, is that Rothschild has seen all of these inconsistencies, and he has pointed them out to Severino, only to be met with a defiant stare from Severino. Because that might lead to the possibility that Rothschild, perhaps for fear that he’ll be blamed resulting in the loss of his job, has not reported this behavior to the higher-ups in the Yankees organization, allowing Severino to continue to get the ball every fifth day. As a rule, baseball can be very fickle, especially when it comes to employing the age-old, “What have you done for lately?” axiom to how changes are made with the coaching and managerial staff. Brian Cashman may or may not stick with his plan to keep Rothschild for the duration of the 2017 season. But if he read the Daily News article, one would have to think he might be asking himself why it wasn’t Rothschild who made those valid points to the media about Severino, instead of two broadcasters. Everything points to the need for a young coaching staff to mesh with the young talent the Yankees have assembled. Rothschild, much like Joe Girardi, has done a credible job when the team was composed of veterans, who calmly went about their business because they knew what their business was, and they didn’t need to be told or guided. Those times, they are a changin’. And if Cashman put even one feeler out there that he was looking, the resumes and texts would come pouring in. At the very least, taking that approach gets the ball rolling for next year. And it might also tell Larry Rothschild to get those old bones of his re-charging because the Yankees cannot afford to see the young staff regressing. I don’t want to see Rothschild run out of town. I just want to see him do a better job.